Tempur-Pedic Continues Tradition of Industry-Leading Innovation, Unveils Next Generation of Mattresses Featuring Breakthrough New TEMPUR Formulation | Tempur Sealy International, Inc.
LAS VEGAS, Jan. 26, 2018 /PRNewswire/ -- Continuing its history of innovation, today Tempur Sealy International, Inc. (NYSE: TPX) announced that new, advanced pressure relief TEMPUR material (TEMPUR-APR Technology) will be incorporated into its new TEMPUR-ProAdapt series of mattresses. Both the 2018 TEMPUR-ProAdapt series and TEMPUR-Adapt series will debut at the upcoming Las Vegas Market as part of the brand's largest launch in history. The TEMPUR-Adapt and TEMPUR-ProAdapt series introductions are made possible by an investment in breakthrough product research and development. They feature a unique combination of innovative materials that adapt and respond to your body's needs continuously throughout the night. They absorb force, relieve pressure, reduce motion and deliver just the right sleep for your body. The mattresses also feature all-new performance-inspired aesthetics. The TEMPUR-ProAdapt series features Tempur-Pedic's most advanced pressure-relieving TEMPUR material ever, TEMPUR-APR. The SmartClimate dual cover system features a zip-off, cool-to-touch outer layer and super-stretch inner layer for convenience and comfort. The series is expertly engineered to give you deep, relaxing sleep that rejuvenates your whole body. The TEMPUR-Adapt series showcases Tempur-Pedic's legendary comfort and support, redesigned for today. Mattresses in the series feature two layers of premium TEMPUR material that continually adapt and conform to your body's changing needs throughout the night. They relieve pressure, reduce motion and help you relax while you sleep. "We are pleased to again raise the bar for breakthrough products in the mattress industry," said Rick Anderson, Tempur Sealy EVP and President, North America. "Every Tempur-Pedic mattress is a work of innovation by industry-leading experts who deeply understand the science of sleep." The new series also feature stronger differentiators to clearly showcase the features of each model and help consumers find the bed that's right for them. "We take pride in listening to our consumers, considering their needs and keeping their interest in mind for every step of the purchase journey," added Anderson. "We are raising the bar in delivering unmatched feels with breakthrough technology, while also simplifying the consumer shopping experience and making it easier for Retail Sales Associates to assist consumers as they select the perfect mattress." 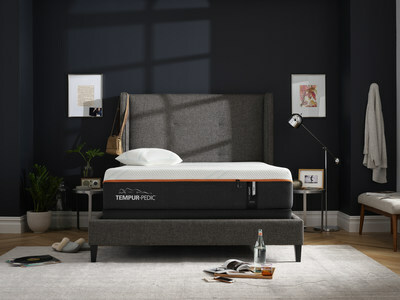 TEMPUR-ERGO: Taking comfort and convenience to new levels, TEMPUR-ERGO features Quiet Mode to help make snoring a thing of the past, plus two-zone massage for relaxation and USB ports for a bed that's as connected as you are: $1,299.